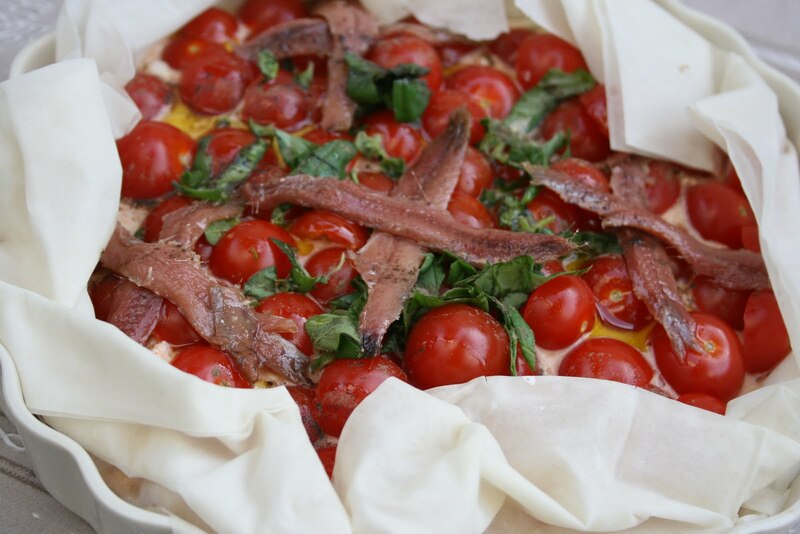 This dish was devised to make use of the sometimes quite insipid but otherwise good looking cherry tomatoes you find around the supermarket aisles in all seasons nowadays! They look lovely in this simple tart and their taste is enhanced by the toffee flavour of the sauce they have cooked in. 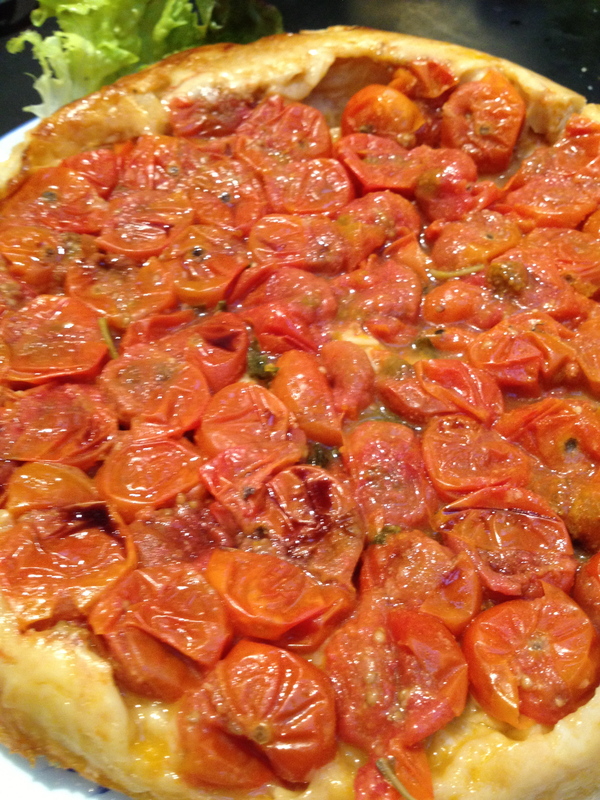 This is indeed a savoury take on the all too traditional Tarte Tatin. You need to cook it in a pan that can both go on the hob and in the oven. I use a cast iron Le Creuset one with small side handles. You will bake it with the crust up and then put a large plate over and turn it upside down to present it with the crust down! No need for Houdini’s skills: this is quite a simple manoeuvre if your pan is not too heavy. Melt some butter and olive oil with one spoonful of sugar: Get it to a light caramel point. Chuck some wine vinegar in and reduce. Fry the tomatoes in the caramel, whole, and leave them to steep for auntil soft. Cut some basil leaves over, grate the parmesan and add a little pepper. Shake the herbs all over. You can also put a few dollops of fresh ricotta or goat cheese around the tomatoes. This stage is optional and the version shown on the picture did not include this: In fact you can modulate the Tatin theme by serving it with fresh cheese on the side, as you would serve an apple Tatin with fresh cream. Lay the sheet of puff pastry over, tucking the sides in like a traditional tatin. Bake for 30 min at 18O until nice and brown. This I made several times this season for dinner parties and it’s always turned out pretty and tasty. All you ever want dinner party food to be! 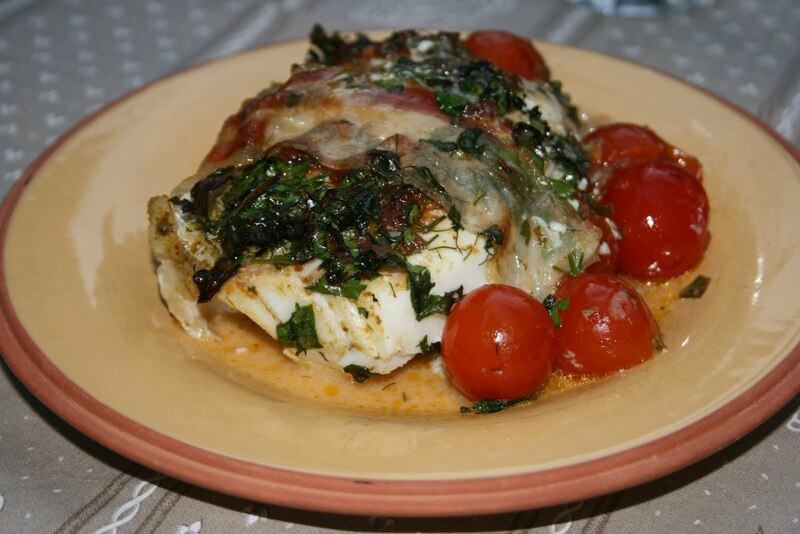 Monkfish is a bit of a luxury but it is the most delicious fish and has NO bones, making it one of the best choices for families. This recipe is super simple and looks brilliant! cherry tomatoes, a baker’s dozen! Get the fishmonger to remove the skin. Lay the tail in an oven proof dish and warm the oven. 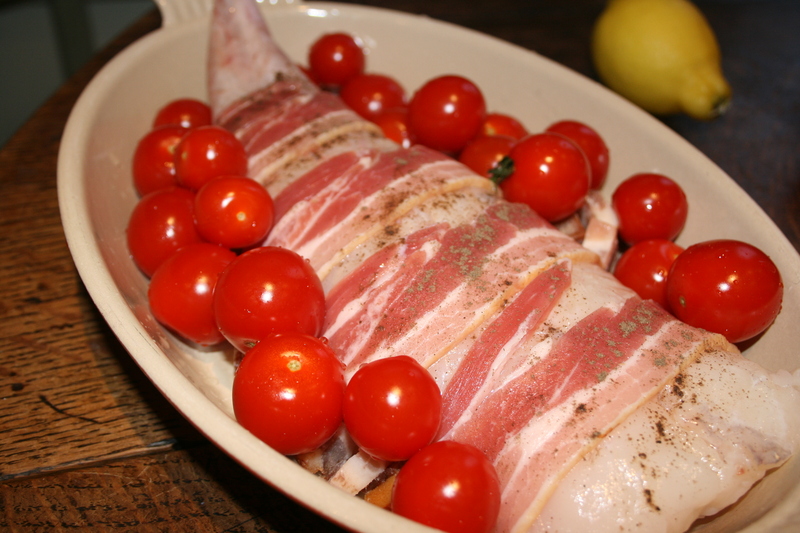 Wrap it in several strips of bacon or pancetta. Scatter clean cherry tomatoes around. Drizzle a little olive oil, season with pepper. Put in a hot oven (180°) for 15 minutes max – depending on size. Best way is to carve it like a roast, in thick slices. Nutrition note: Fish is a very healthy source of protein. This is lean and full of vitamin Bs, omegas, phosphorus and selenium. So great against ageing! I love fish but these days you are sometimes made to feel somewhat guilty for advocating such irresponsible tastes… So to get to the bottom of it (no pun intended), I went to see the amazing Natural History museum current exhibition “The Deep” and immediately afterwards searched the Internet for the Marine Conservation Society which is responsible for updating a list of “dos and donts” on http://www.endoftheline.com. Consulting their Good Fish guide, I was happy to learn that being a responsible shopper does not mean you have to forgo fish altogether but just that you need to be informed of what to buy when and from where. This is quick and needs to be messy so don’t hesitate to use your hands: Smear the fish loins with pesto and Harissa, sprinkle the herbs and baste generously with the lemon juice. Especially if you have been a bit too keen on the Harissa. Enjoy the healthiest protein around with a clear conscience. If you have enjoyed my Soba Salad with King Prawns, you will love this mediterranean vegetarian take on it! First boil the Soba noodles 5 minutes in boiling water. Drain and rinse under cold water. They must be still firm but cooked. 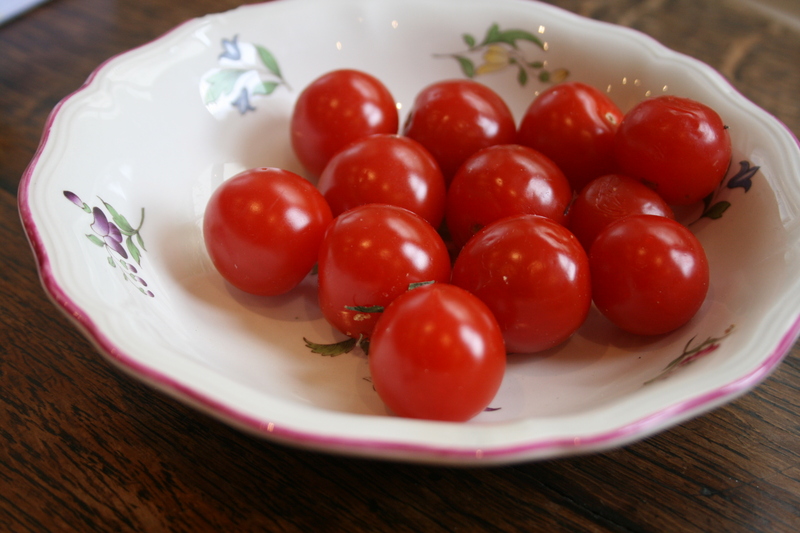 Fry your cherry tomatoes and sliced red pepper in a wok or cast iron pan with a spoonful of rapeseed oil. Throw in the drained pasta, season with soy sauce, rice vinegar and ginger or 5 spices. Shake around the wok until coated with the sauce and warm. Reserve and start dicing the avocado, chopping the cucumber in strips (ideally with a mandolin or grater) and slicing the spring onion finely lenghtwise. 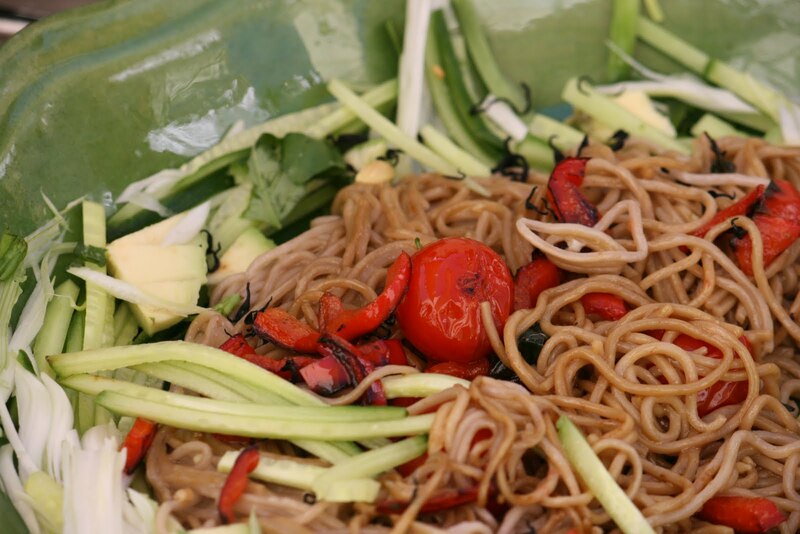 Assemble all the vegetables in a dish then throw the noodles in and season with some more soya sauce and crushed ginger, the pressed garlic and rice vinegar. Add a dash of olive or sesame oil if too dry. The salad must be generously dressed and have a certain bite! Tear some basil into it and serve at room temperature or cold.